If you’re stuck in an endless cycle of diet restriction and failure, Laura Thomas may have the answer - intuitive eating. How many times have you started a new diet determined to be ‘good’, and then found yourself indulging in your favourite ‘forbidden’ foods after days or weeks of depriving yourself? 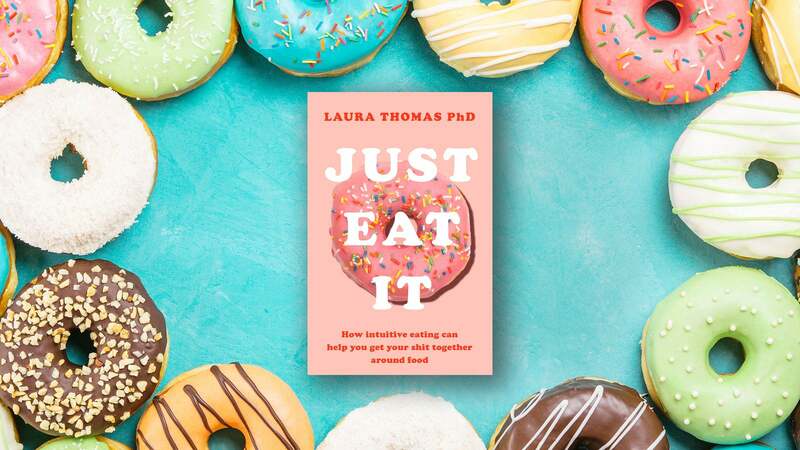 Here, Laura Thomas author of Just Eat It, explains why the diet cycle means fad diets are doomed to fail, and why intuitive eating is the healthy alternative. The start of a new year, is the time everyone jumps on the latest fad dieting bandwagon. This year it’s keto, pegan, and the super low energy ‘Fast 800’ – fast route to disordered eating more like, but I digress. Whatever your diet of choice, they all have a couple of things in common. 1) They ‘work’, at least in the short term by reduce the total number of calories you eat. 3) they don’t work in the long term. For anyone who has ever been on a diet, this probably doesn’t come as a surprise. Yet every year, we enthusiastically jump on the bandwagon, and try to convince ourselves this will be the one that sticks. 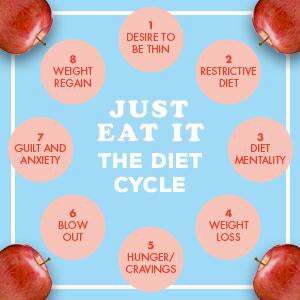 And we go for one more spin around the diet cycle. Step 1: Desire to be thin: When you start a new diet or ‘lifestyle’ it’s usually pretty exciting, you're pumped about becoming the version of you you always wanted to be. And if you're being totally honest, that's probably something to do with changing the shape/size of your body. Step 2: Restrictive Diet: So you follow all the rules: HIIT 4 x a week plus a couple of yoga classes to keep you chill. You ditch gluten, dairy, sugar and anything 'processed'. Step 3: Diet Mentality: You become hyper vigilant of food choices, carefully pick which restaurant to eat at, compulsively check labels, track activity/calories/macros/whatever. Step 4: Weight Loss: You start to see some changes in your body and feel encouraged. Step 5: Hunger + Cravings: But the cravings start to kick in and you can't keep up with the exercise. Step 6: Blow Out: You end up saying 'f*ck it' and eat all the food. Step 7: Guilt + Anxiety: You feel crappy about all the food. Step 8: Weight Regain Your weight loss slows due to increased cravings and slowing metabolism. So, you're back at the start – the restrict/blow out cycle continues, maybe next time you try Whole 30 or intermittent fasting. You convince yourself that THIS is the one what will stick, but the cycle goes around and around until you decide to break it. So, how do we get off this merry-go-round? Intuitive eating is a process that has caught the attention of nutritionists, dietitians, and researchers as a viable alternative. To help us get unstuck; helping us make peace with food, our bodies, and ultimately ourselves.